JOJO was born in October 2014 so is still a youngster. 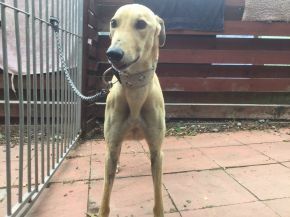 He is a muscular, handsome fawn male greyhound with a lovely character. He is also one of the friendly, waggy brigade and he will always welcome you if you stop by. He is quick to get used to his new surroundings in the centre and he is unfazed by the many dogs which walk by his kennel. He enjoys his walks and being outdoors and he walks well on lead. He is clean in his area and a happy boy. He will enjoy the love and attention that a new family can bring, and in return he will bring much joy to his new owners.